If you like oatmeal, you’ll love this simple Baked Raspberry Porridge. I just started baking my oatmeal in batches during my weekly meal prep and I’m pretty happy about it. 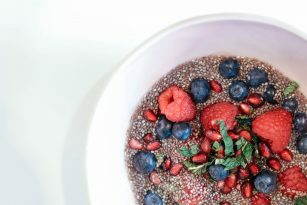 I think you’ll love this Baked Raspberry Porridge that can be made with a variety of fruits, nuts, and even different grains. Baking your oatmeal might save you a lot of time, effort, and the result will be delicious! If you don’t love raspberries, you can use whatever fruit you enjoy from fresh blueberries, mango, pineapple, banana, cherries, apples, the list goes on. In addition to the variety of using whatever fruit you love and have on hand, you can also use frozen. Frozen fruit is often more affordable, easy to get your hands on, and even easier to keep stocked in your freezer for a quick recipe to make on your meal prep day. A win-win. I’ve been making varieties of this baked porridge for the past month because it’s so easy to toss in the oven alongside sweet potatoes, tofu, veggies, etc. on my meal prep day. It also makes several servings, between 4-6 depending on your unique portion needs, and tastes just as delicious heated up as a leftover as it does straight out of the oven. A compound in raspberries may also help fight obesity by increasing our metabolism in fat cells, a phytonutrient called rheosmin (a.k.a. raspberry ketones). These ketones work by increasing the enzyme activity, which may help our bodies with overall fat metabolism and less likely to store fat, utilize fat stores, and reduce inflammatory molecules from fat cells. Although further research is needed in this area (dosages were used with rat models at very high doses). Raspberries are one of several berries that may help reduce certain risks of cancer due to its vitamin C content, antioxidant content, and fiber. Fresh raspberries contain about 8g of fiber per 1 cup. Both rolled oats and quinoa contain fiber, minerals, and small amounts of plant-based protein. Oats have been known and studied for their cholesterol-lowering effects due to their fiber content, mainly in the form of beta-glucan soluble fiber. Studies have shown that consuming this type of soluble fiber helps reduce overall cholesterol, especially LDL, decreases the risk of heart disease, and aids in digestion. Oats also help maintain stable blood sugars to keep your energy nice and steady. Fiber isn’t the only key player in oats, antioxidants also have been shown to help with the cardiovascular benefits and immune health along with oats magnesium content, which aids in the secretion of insulin and glucose among enabling many other enzymatic functions. If you’re making this recipe vegan, instead of the eggs used in this recipe use flax seed for the binding (check recipe). To boost the protein try adding in two scoops of protein powder with 1/4 cup almond milk or water into the recipe (vanilla will go best) to make this a more balanced meal. Otherwise, try serving this alongside a protein shake, tofu scramble, etc. to ensure you have a dedicated protein source. In a large mixing bowl, whisk the eggs and milk. Add the remaining ingredients and stir until combined. Grease a casserole baking dish with coconut oil or ghee before pouring the mixture into the dish. Bake for 30 minutes or until golden brown on top. Serve with optional garnishes and enjoy warm, room temperature, or chilled.